How can a piece of A4 paper be folded in exactly three equal parts? 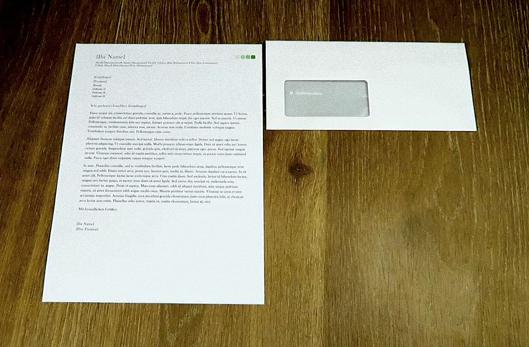 This is something that always annoys me when putting an A4 letter in a oblong envelope: one has to estimate where to put the creases when folding the letter. I normally start from the bottom and on eye estimate where to fold. Then I turn the letter over and fold bottom to top. Most of the time ending up with three different areas. There must be a way to do this exactly, without using any tools (ruler, etc.). 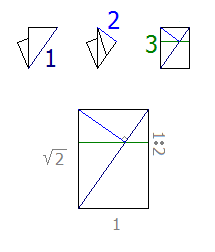 Fold twice to obtain quarter markings at the paper bottom. Fold along the line through the top corner and the third of these marks. 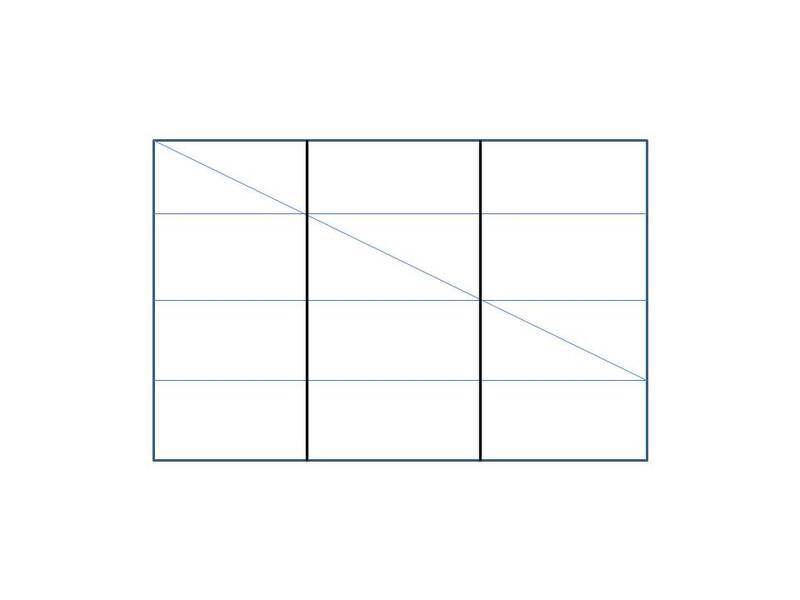 The vertical lines through the first two marks intersect this inclined line at thirds, which allows the final foldings. Here is a picture to go with Hagen von Eitzen's answer. 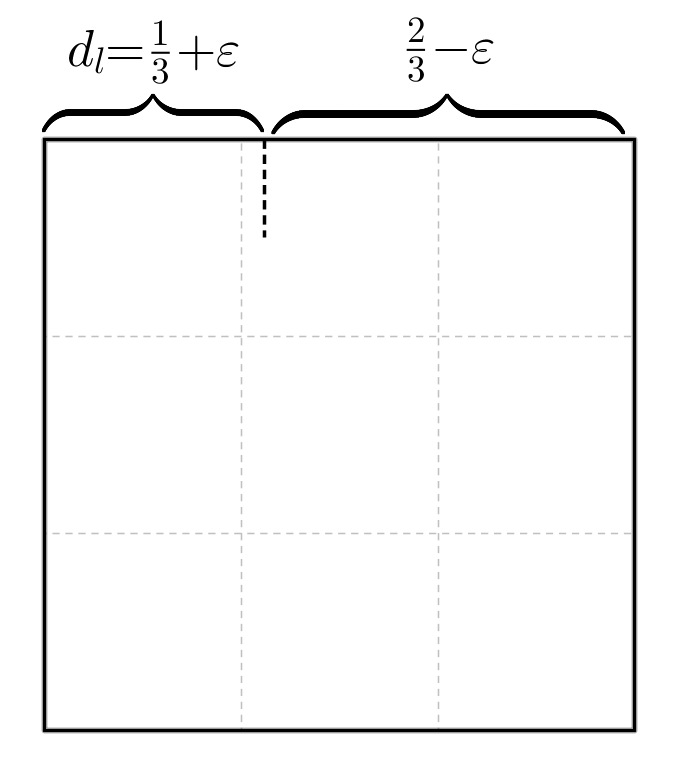 The horizontal lines are the result of the first two folds. The diagonal line is the third fold. The heavy lines are the points at thirds for folding into the envelope. This is both practical (no extra creases) and precise (no guessing or estimating). This solution works only with a sheet of paper having aspect ratio of sqrt(2) (as A4 has). Only two extra folds required. 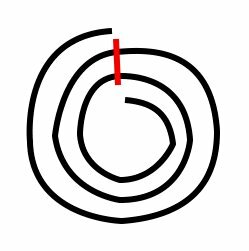 Roll in to a cylinder until both edges are opposite to each other. Assume a 120 degree angle and fold as shown below. For accuracy, match edge-side to any of the other two sides. Beyond the more geometric methods explained so far, there is an iterative algorithm (in practice, as precise as any exact method) due to Shuzo Fujimoto that I think no one mentioned. 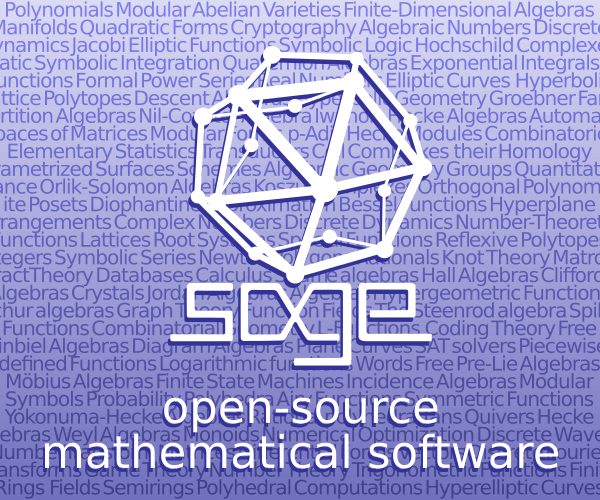 In fact, the following method can be generalized to any shape, size and number of foldings. Let me denote $d_l$ the distance from the left side of the paper to the first mark on the left and $d_r$, the distance from the right side to the right mark. To simplify, assume that the lenght of the side you want to divide is 1. Make a first approximation for $d_l$. You want $1/3$, but imagine you take $1/3+\varepsilon$ ($\varepsilon$ being some error to the right or to the left). Thus, on the right you now have $2/3-\varepsilon$. Next, divide the right part into two for the first approximation of $d_r$ (by taking the right side of the paper to your first pinch; again, just a pinch). This gives you $d_r=1/3-\varepsilon/2$, thus, a better approximation! Now, repeat this procedure on the left. On the left part you now have $2/3+\varepsilon/2$. 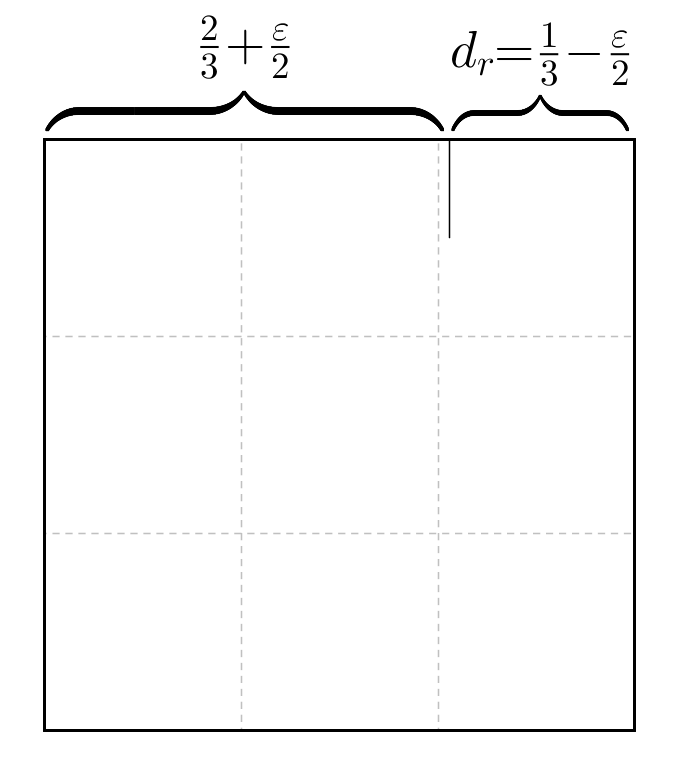 Take the left side of the paper to the second pinch to obtain a second approximation of $d_l = 1/3+\varepsilon/4$. Note that, after two pinches, you have reduced your initial error to a quarter! If your initial guess was accurate enough, you will not need to continue more. But, if you need more precission, you just have to repeat the process a couple of times more. For instance, an initial error of $\varepsilon=1$cm reduces to less than 1mm (0.0625mm) after repeating the iteration twice. Fold bottom to middle, do not crease! A non-mathematical but quick way (which I used when I had to mail hundreds of letters years ago): Bend the paper in the Z-shape as you would want it to fold but without creasing yet, gently push the edges (top of paper and 2/3rds down on the left, 1/3rd down and bottom on the right) together so the edges align automatically, while at the same time making the pile flatter, and finally press the edges down to create the folding. You can do that with 10 sheets simultaneously and still get reasonable results. Does not produce an exact solution but usually does better than guessing the first fold. Roll the paper into a tube. Allow an overlap to develop that looks right. Carefully flatten the tube adjusting the overlap as necessary. I love the geometrical solutions! That said, there is a trick for more accurate estimation. The trick is not to try to judge 1/3 of the whole sheet but to try to judge 1/2 of the remaining sheet while you are doing the first fold. 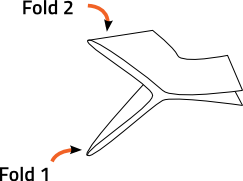 In other words, as you fold the bottom 1/3 of the sheet upwards, the edge that you are moving upwards approaches the exact middle of the remaining 2/3 of the sheet. For me, this is easy enough to judge, and results in folds accurate to within a couple of millimeters. Bend the paper in half, top to bottom, making crease #1 at the center on one edge of the paper. Bend top down to fit in crease #1 to make crease #2 (1/4 distance from the top). Reverse paper (back face), bend so crease #1 and crease #2 align and make crease #3 halfway between them. Reverse paper (original face), bend so that crease #3 fits into crease #2. Make crease #4 halfway between them. Bend so that crease #3 fits into crease #4. Make crease #5 halfway between them. Fold bottom to meet (approximately) 1/3 of the way between crease #5 and #4 (closer to #5). Since you know the height of the envelope (which is printed on the packaging when you buy them) you can, if you want to be exact, eyeball 10 mm (for a C5/6 envelope) or 14 mm (for a C6/5 envelope) off the height of the envelope. Eyeballing such a short length is much easier than eyeballing a third of the paper height, and I can do it just as exactly as I can fold a paper according to the instructions in the other answers – which, you may note, don't lead to exact results when you use real paper and real hands instead of maths (see for example the comment by Henk Langeveld under the accepted answer). How can I fold paper into 3 x 4 grid? Or prove that it can't be done? What is the Mathematics behind the folding an A4 sheet in 3 equal parts?? How many times can a piece of paper be folded in half? Calculating perimeter of n-sided regular polygons using only height? Can a piece of A4 paper be folded so that it's thick enough to reach the moon?